As with the spot gold price silver also appears to have reached a pause point following its recent rally with the last few days finding sustained resistance at the $16.50 per ounce level. 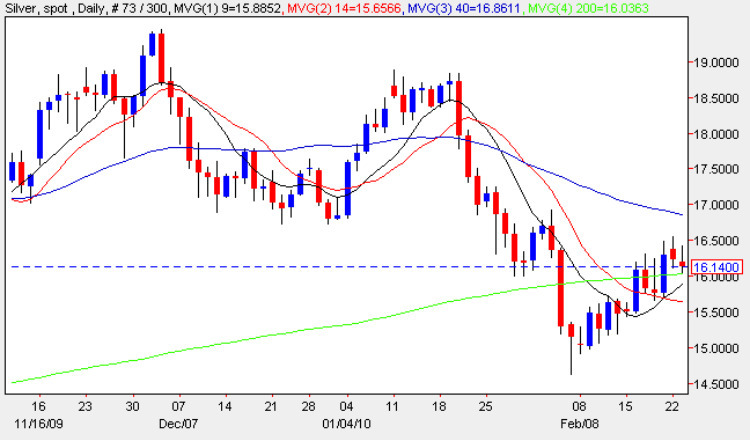 The technical difference between the gold and silver charts is that silver prices remain firmly sandwiched between the moving averages and in addition have to fight their way through some deep resistance in the $17 – $18.50 price area. Friday’s wide spread up candle was particularly important in that it finally broke and held above the 200 day moving average which until this time had presented stiff resistance to the rally. This would now appear to be offering a support area and with the 9 day moving average now crossing above the 14 this is adding to the mildly bullish picture at present. However, the technical picture remains fragile and until we see a strong break and hold above the 40 day moving average coupled with penetration of the initial resistance area from $17 and above then any rally is likely to remain hamstrung.